Ha, I just read Knicks Wall's description of Zion as "Draymond Green exposed to gamma radiation"
smackeddog wrote: Ha, I just read Knicks Wall's description of Zion as "Draymond Green exposed to gamma radiation"
Zion however is more of a two way player and less of as lockdown defender than Draymond. A player like Zion put unique challenges on his team, and the coach would certainly need to earn his bacon to devise a way to maximize his strengths and minimize weaknesses with the players that share the floor with him. technomaster wrote: A player like Zion put unique challenges on his team, and the coach would certainly need to earn his bacon to devise a way to maximize his strengths and minimize weaknesses with the players that share the floor with him. I like Barrett too, but Zion doesn't really seem to have too many weaknesses to his game. Barrett fits a traditional stereotype better so it maybe easier to bring him along for the coach. 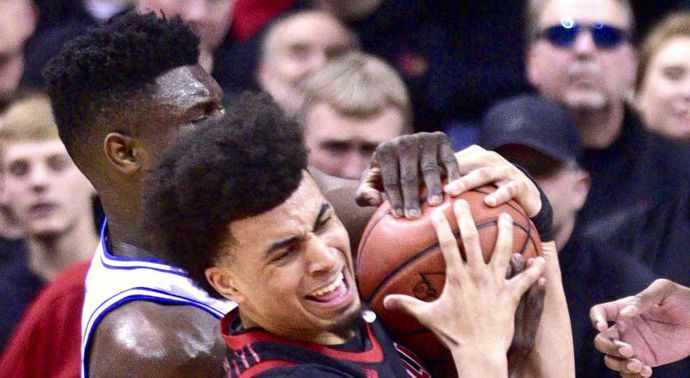 Zion is in level of his own. Tommy Dee is high on Barrett and I believe thinks he's the clear #2. Wassermann seems to have more reservations and says Morant could be picked higher depending on who's picking at #2.
technomaster wrote: Heh. Here's a sampling from the last 5 drafts what you get at #3 vs #5 & #6. It's not rocket science, but the farther from #1 in the lottery, the odds of a full blown bust are greater. High ceiling, high bust factor. Hypothetically strong tools, but undeveloped games. Interesting in the mid-late first round, I think you start getting lower ceiling, high floor players. Older players/late bloomers. That's not to say that there aren't draft mistakes. If there were a redraft, Mitchell Robinson would be a lottery pick ahead of Kevin Knox - That's how excellent a draft steal Robinson is! He's the type of low risk gamble that can change a franchise. But... there's a gap still between what you get with Ayton and Doncic and Mitchell, so if you have a chance to give yourself the best possible odds with the highest floor, you do it. Here the problem with what you just posted, you don't factor in front office competency. A good front office may be able to get a stud at #6 and a bad front office a bust at #3. It's not just about numbers, you have to incorporate the human element. Based on this last draft, I get the feeling our current front office is pretty sound at evaluating talent. PresIke wrote: Tommy Dee is high on Barrett and I believe thinks he's the clear #2. Did you get a chance to hear Tommy Dee on the Filmschool pod? I thought it was a great podcast. I agree with this. I think some part of this is analytics (e.g., how will this guy play in NBA space vs. college space), some are based on IQ and motivation, and some is that talent knows talent. Yeah. I'm praying we now have a front office who can tell the difference. I totally get what you're saying. Zion looks like a kid who can be really, really good in the right situation, with the right coach, with the right teammates, playing the right system. I'm just not sure he's a guy you can throw out there on any team and he'll be a stud. I can see Zion being a stud or a huge bust at about the same odds. Speaking of gamma radiation, Zion put a dent in a fully inflated ball!! Never seen anything like it in my life! He's the number 1 pick by a mile!!! Uptown wrote: Speaking of gamma radiation, Zion put a dent in a fully inflated ball!! Never seen anything like it in my life! He's the number 1 pick by a mile!!! But look at those chubby fingers! Not to mention that the #1 pick in the draft is usually not the best player in the draft, and thats what makes tanking so damn stupid. Of the top 20 players in 2019 only 5(Kyrie, LBJ, KAT, simmons AD) are in that group, and if it wasn't for LBJ love for his hometown, none of them are going to win a title with the team that drafted them. If I'm the knicks, with the cap money they have, I make sure and call 29 teams to see what they have to offer..AD, Lillard, Booker, Towns, CJ, Tatum..
with the cap space and picks the knicks have, they have the ability to be a top team in the league over night if the make the right moves..
knicks1248 wrote: Not to mention that the #1 pick in the draft is usually not the best player in the draft, and thats what makes tanking so damn stupid. Hmm. I challenge this assertion. Let's look at the last 10 drafts and who I think is the tops NOW, but I'm also including some other names alongside who we could easily put in the debate for at least 2 seasons. 2018: Seems to be Doncic #3, though Ayton #1 is quite good. Per minute, Bagley #3 is putting up numbers. 2017: Mitchell #13. Tatum #3 has flashed brilliance on a deep team, Fox #5 and Markannen #7 are developing nicely and seem to have more statistical impact than Tatum. ( Fultz has been injured/likely bust. 2016: Ben Simmons #1. Jamal Murray #7 is developing quite well too. Brogdon #36 was ROY - his value was a major game changer for the Bucks, who basically got a top 5 player in the draft in the 2nd round! 2015: KAT #1. Though Devin Booker #13 is debatably better. D'Angelo Russell #2 has quietly become a stat stuffing all-star in year 4. Then there's the Unicorn #4. 2013: Giannis #15. Oladipo isn't far behind #2. Same for Gobert #27. Anthony Bennett #1 was a major bust. MCW #11 gets special mention as the ROY, but has missed 28+ games/year for the past 5 seasons. He's not even a shadow of his rookie self. Oladipo and Gobert took a while to emerge as stars. 2012: Anthony Davis #1. Lillard #6, Beal #3, and Drummond #9. Without Draymond Green #35, the dynasty Warriors might not be a dynasty. 2011: Heh, basically most of this year's FA crop come from this draft. Kawhi #15. Kyrie #1 is right up there, as are Kemba #9 and Klay #11, Jimmy Butler #30. Just 2 years ago, Isaiah Thomas #60 would have been near the top of this list. And 3 years in, Chandler Parsons #38 would have been right there with the top guys. Kyrie was the best in 3+ out of 7.5 seasons - he's mostly hampered by missing 20+ games in 4 seasons. 2010: Paul George #10. John Wall #1, Boogie Cousins #5, and even Gordon Hayward #9 have all staked some claim at the best player of this class, but injuries, yo! Wall was the best in 4+ out of ~8.5 seasons. 2009: Steph Curry #7. James Harden #3, Blake Griffin #1, DeRozan #9 have all flashed all-NBA type of seasons. Griffin was the best of the bunch in 4 of those years. For "now", I see the #1 pick being the best in 3/10 drafts (2016, 2015, 2012), and certainly deep in the conversation for best in 4 more (2018, 2011, 2010, and 2009). 7/10 is pretty good. As for the remaining 3: 2017 (Fultz) is looking like a bust right now mostly due to injury - but note that his former teammate Embiid didn't even play in his first 2 seasons and look at him now! ), 2014 (Wiggins) is good, just isn't awesome (but he won ROY! ), 2013 (Bennett) is the worst #1 pick in the history of the NBA. Teams hit on 5/10 on the #3 overall pick, followed by 4/10 on the #9 pick (Clearly DSJ is destined to follow this trend). Later first round: Mitchell #13, Giannis #15, Leonard #15, Gobert #27, Butler #30. I think when you score with non-lottery pick, they really can change the complexion of a franchise. You're basically adding a top player to a team that "should be" a playoff-caliber team. Of course, any draft "win" looks even better if it was another team's pick. I pointed out in 2017 we should have traded that 8th pick because he never produce a star player, most were bust. I was accused of not wanting to build through the draft. It’s the rest of your inane comments that make any accusation of you valid. Did you trade the pick that turned out to be Mitch for a pick that also did not turn out great in a season and a half? All picks are a crap shoot. You don’t get to trade a pick for just an allstar player because the other team also understands shyt. You get to sit back and “laugh” in hindsight with a smug grin but actually you don’t look good doing it. Your accused of incomplete thoughts. Literally no one expected Bennett to go 1st, everyone was shocked. Not to mention, that was considered a bad draft going into it without any highend prospects.